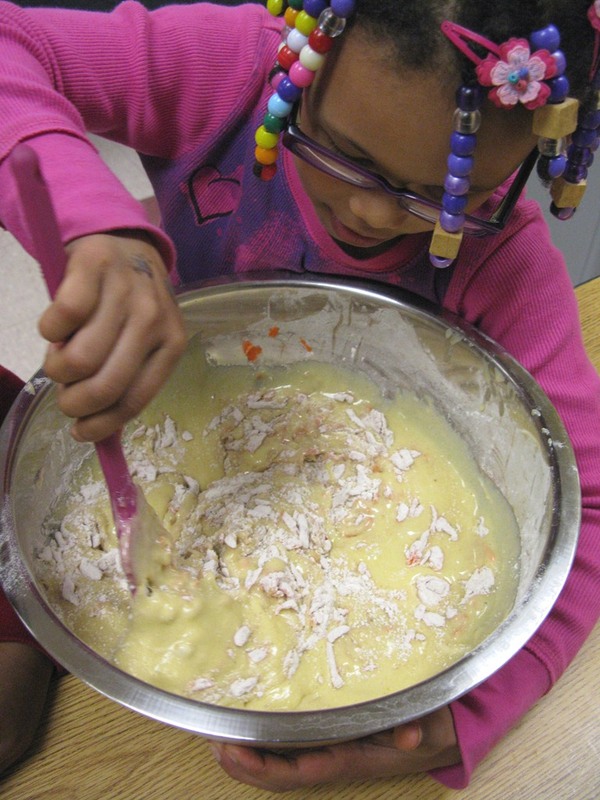 This week marked our last session in this year’s baking segment and I wanted the kids to end on a super-delicious note. So here’s a carrot cake sure to satisfy the most demanding sweet tooth. Kids like sugar too much. So remember: food like this is intended as a special treat, not something to be consumed on a daily basis. Carrot cake has the added advantage of requiring quite a bit of vegetable prep. That may not seem like an advantage to the average home cook. 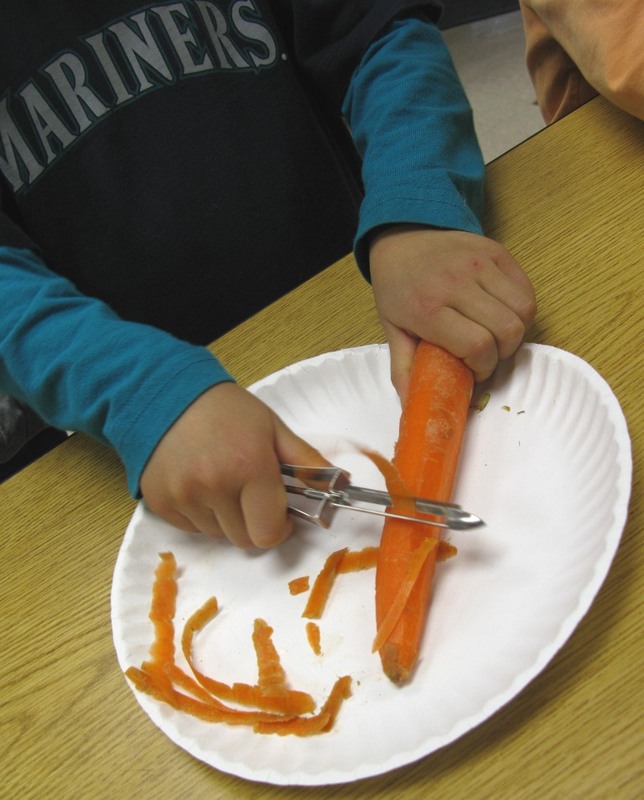 But if you are trying to keep a group of children busy in the kitchen, there’s nothing like peeling and grating carrots. Hand a kid a vegetable peeper and she will occupy herself for the rest of the day. This cake calls for a whole pound of carrots. We do everything by hand. But if you do not feel so inclined, feel free to plug in your food processed to speed up some of the chopping and mixing this recipe calls for. First, prepare a 13-by-9-inch baking pan by greasing the inside of the pan, lining the bottom with a sheet of parchment paper and greasing the parchment paper. Set aside. To the pound of peeled and grated carrots, add 2 1/2 cups unbleached all-purpose flour, 1 1/4 teaspoons baking powder, 1 teapsoon baking soda, 1 1/4 teaspoons ground cinnamon, 1/2 teaspoon grated nutmeg, 1/8 teaspoon ground cloves, 1/2 teaspoon salt. Mix well. In a separate bowl, place 1 1/2 cups granulated sugar, 1/2 cup packed light brown sugar and 4 large eggs. Mix these together with a whisk and beat well until frothy and thoroughly combined. Continue beating while drizzling in 1 1/2 cups canola oil. Beat until the oil is completely emulsified. Pour the wet mix into the dry mix and stir until all of the ingredients are incorporated. Pour the batter into the prepared baking pan and place in a 350-degree oven for 40 minutes, or until a toothpick inserted into the middle of the cake comes out clean. You might turn the pan from front to back halfway through the baking process. Allow the cake to cool at least two hours before removing it from the pan. Invert it onto a cutting board or serving platter and prepare the frosting. Process 8 ounces softened but still cool cream cheese, 5 tablespoons unsalted butter softened but still cook, 1 tablespoon sour cream and 1/2 teaspoon vanilla extract. We used the back of a wooden spoon for this, but you can also use a food processor. When the mix is smooth, scrape down the sides of the bowl and add 1 1/4 cups confectioner’s sugar. We used a rubber spatula to gently work the sugar into the cream cheese mix until it was completely incorporated and there were no lumps. 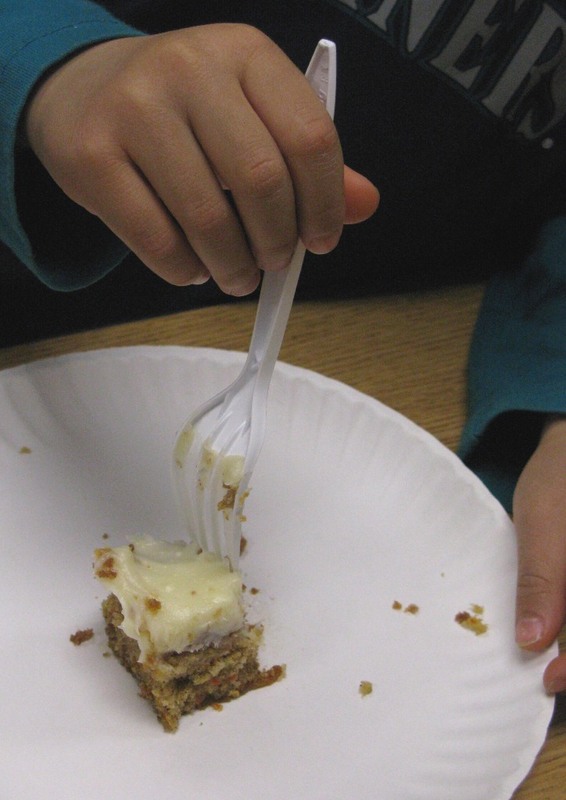 Use an offset spatula to first spread a thin layer of frost over the top of the cake. This will trap any crumbs so they do not show through when you spread the rest of the frosting.